Am I the only one who seems to get costumes together at the last minute? Now, I realize that Halloween is weeks away, but youngest daughter has a Harry Potter costume party this week. 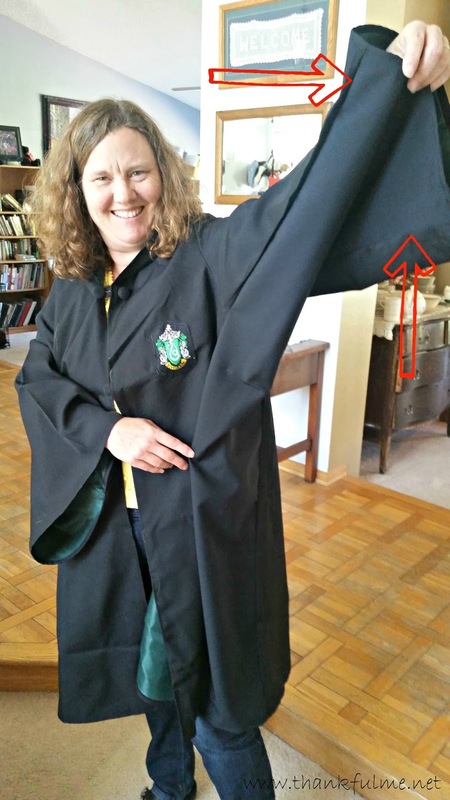 The Hogwarts robe that we had ordered online was woefully mis-sized, and with no luck finding another one, it was time to get creative. (Yes, I probably could have found one in the correct size at Universal Studios, but I didn't want to spend a lot of money.) The problem was, I wasn't sure how I was going to make the cloak bigger. Youngest daughter was resigned to going sans cloak, and just making do with what she was going to wear underneath. Fortunately, I had one of those "a-ha!" moments early one morning, and I could finally picture how to make the costume larger without it taking too much effort (or money). Unfortunately, I didn't think to take photos during the process, but the idea is so simple, hopefully words and after-photos will suffice. Start by ripping out the side seam that extended from the bottom hem all the way up to the armpit, and down the arm to the hem at the wrist. Do this for both the seam that goes down the right arm, and the seam that goes down the left arm. 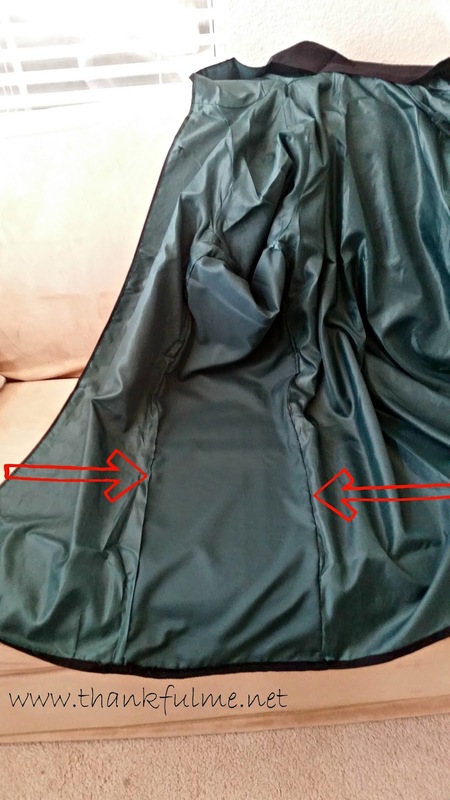 If the cloak is lined (ours is), also rip the seam of the lining on both sides of the cloak. In the photo below, the arrows show the two seams that are on each piece of added lining. Repeat for the other arm. All that is left then is finishing the hems--both at the bottom of the cloak, and at the sleeve. You could either do an overlock stitch on the outer fabric, or do a folded hem (make a narrow fold, then fold again). Either way, make sure your outer fabric hem covers the raw edge of the lining. Then stitch in place. Of course, if you are skilled in casting the Engorgio spell, you might not need to do any sewing, but hopefully these directions helped any fellow Muggles out there! Thanks for simple projects, and for inspiration. What a clever solution - well done! Thank you. I'm just glad it worked! I don't sew, but a friend of mine in high school did. She did something similar with her jeans. She opened the seams up the outside of the pants, then added a few inches of a patterned fabric and sewed them back up. Such a cool idea. Clearly, seeing as how I remembered it from 30 years ago. I'm sure your daughter was thrilled with your problem-solving skills. Don't you love those aha moments? It turned out great and I am sure she really appreciated your efforts! She did, and I was glad to figure it out!